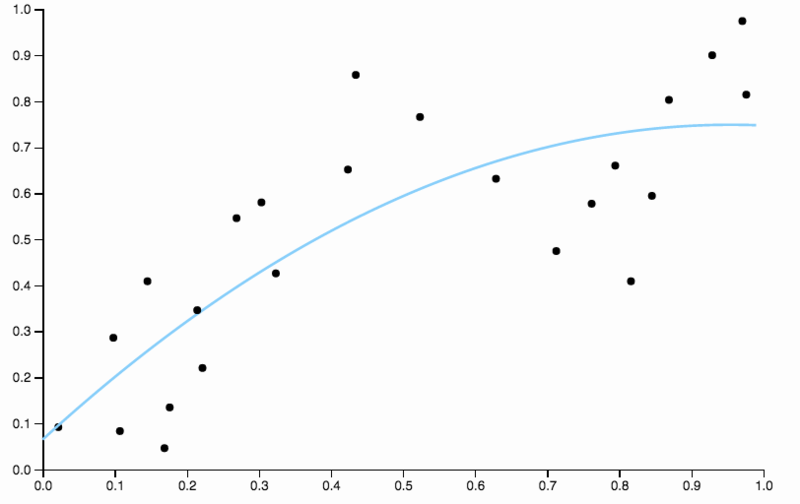 Why use regularisation in polynomial regression instead of lowering the degree? When doing regression, for example, two hyper parameters to choose are often the capacity of the function (eg. the largest exponent of a polynomial), and the amount of regularisation. What I'm confused about, is why not just choose a low capacity function, and then ignore any regularisation? In that way, it will not overfit. If I have a high capacity function together with regularisation, isn't that just the same as having a low capacity function and no regularisation? 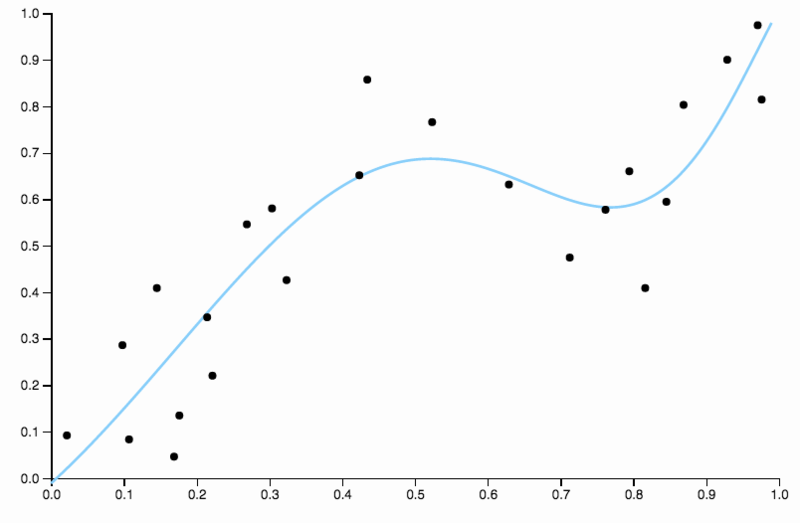 I recently made a little in browser app that you can use to play with these ideas: Scatterplot Smoothers (*). It's clear that the quadratic polynomial is just not flexible enough to give a good fit to the data. We have regions of very high bias, between $0.6$ and $0.85$ all the data is below the fit, and after $0.85$ all the data is above the curve. We get a really nice fit! It's worth a little focus on one aspect of well chosen above. When you are fitting polynomials to data you have a discrete set of choices for degree. If a degree three curve is underfit and a degree four curve is overfit, you have nowhere to go in the middle. Regularization solves this problem, as it gives you a continuous range of complexity parameters to play with. how do you claim "We get a really nice fit!". For me they all look the same, namely, inconclusive. Which rational are you using to decide what is a nice and a bad fit? The assumption I'm making here is that a well fit model should have no discernable pattern in the residuals. Now, I'm not plotting the residuals, so you have to do a little bit of work when looking at the pictures, but you should be able to use your imagination. From 0.0 to 0.3 they are about evenly placed above and below the curve. From 0.3 to about 0.55 all the data points are above the curve. From 0.55 to about 0.85 all the data points are below the curve. From 0.85 on, they are all above the curve again. 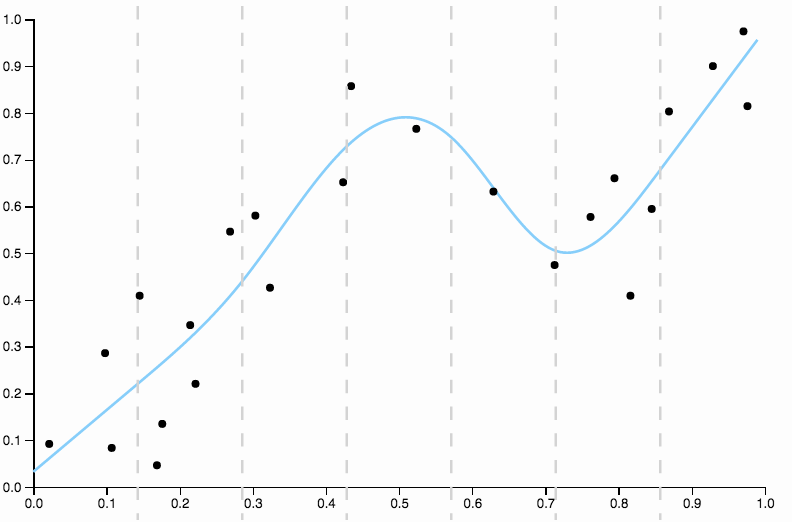 I'd refer to these behaviours as local bias, there are regions where the curve is not well approximating the conditional mean of the data. Compare this to the last fit, with the cubic spline. I can't pick out any regions by eye where the fit does not look like it's running precisely through the center of mass of the data points. This is generally (though imprecisely) what I mean by a good fit. Their behaviour at the boundaries of your data can be very chaotic, even with regularization. They are not local in any sense. Changing your data in one place can significantly affect the fit in a very different place. I instead, in a situation like you describe, reccomend using natural cubic splines along with regularization, which give the best compromise between flexibility and stability. You can see for yourself by fitting some splines in the app. No, it isn't the same. 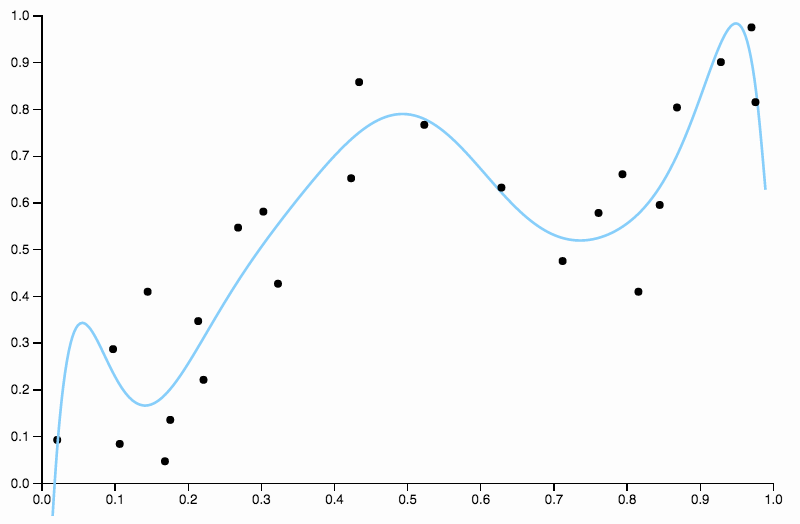 Compare, for example, a second-order polynomial without regularization to a fourth-order polynomial with it. The latter can posit big coefficients for the third and fourth powers so long as this seems to increase predictive accuracy, according to whatever procedure is used to choose the penalty size for the regularization procedure (probably cross-validation). This shows that one of the benefits of regularization is that it allows you to automatically adjust model complexity to strike a balance between overfitting and underfitting. For polynomials even small changes in coefficients can make a difference for the higher exponents. $L_2$ regularization ( least squares ) usually encourages many small coefficients but none exactly 0 and therefore the higher order monomials are able to make a difference. All the answers are great and I have similar simulations with Matt to give you another example to show why complex model with regularization is usually better than simple model. I made a analogy to have intuitive explanation. If two persons are solving the same problem, usually the graduate students would work better solution, because the experience and insights about the knowledge. 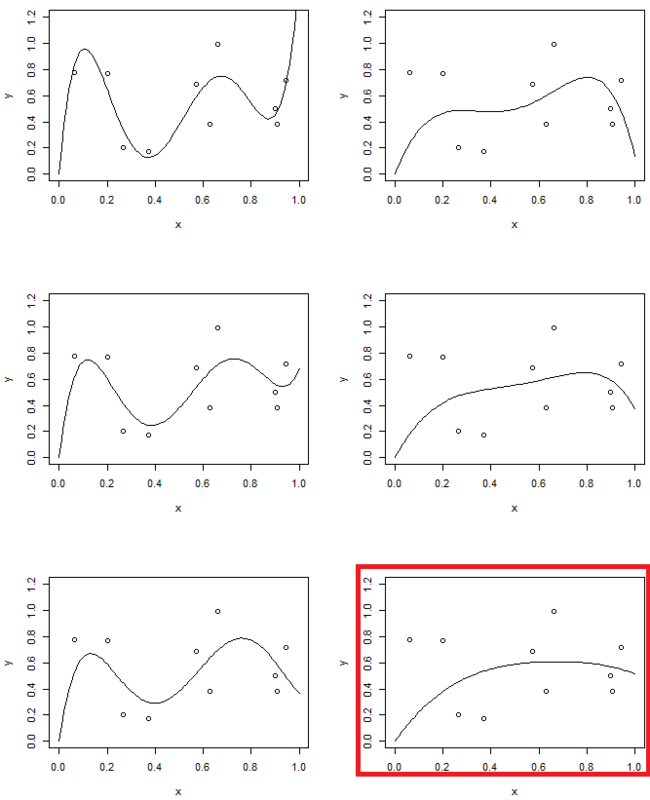 Figure 1 is showing 4 fittings to the same data. 4 fittings are line, parabola, 3rd order model and 5th order model. You can observe the 5th order model may have overfitting problem. 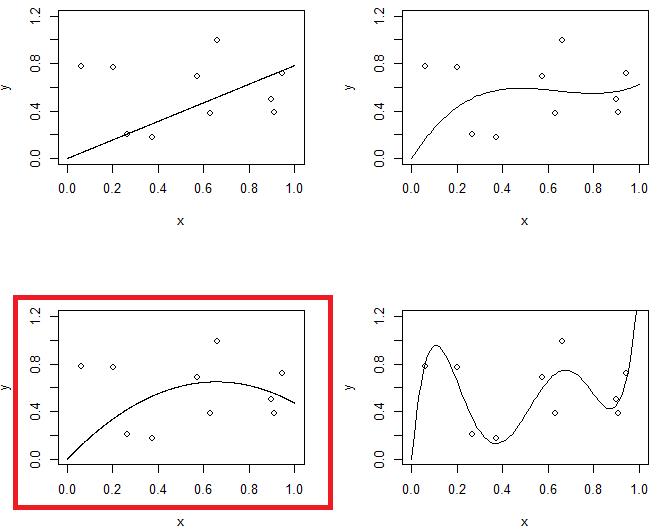 On the other hand, in the second experiment, we will use 5th order model with different level of regularization. Compare last one with the second order model. (two models are highlighted) you will find the last one is similar (roughly have the same model complexity) to parabola, but slightly more flexible to the data well. Not the answer you're looking for? Browse other questions tagged regression machine-learning optimization regularization polynomial or ask your own question. How to use predict() function to average over polynomial terms in a linear model, so that it does not over- or under-estimate the data? How can one design a polynomial function that really does require higher order terms to approximate it well? Why do hypothesis functions with high degree or large number of features have high variance(tend to overfit)? Why do we not take the average of the regularization hyperparameters chosen by hold-out/cross validation? 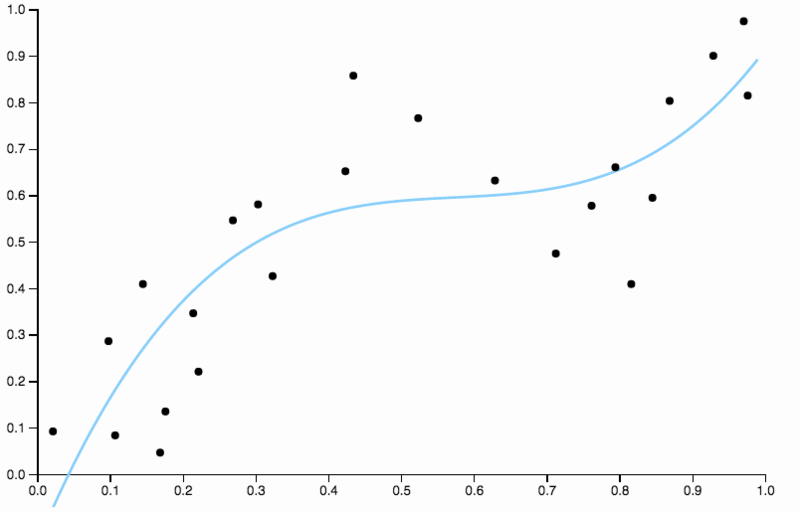 In regularised regression, why not penalise higher degree coefficients more?